Barking Rabbits: I would have never thought that BP wouldn't have a way to plug a gushing underwater oil well that was already figured out. I would have never thought that BP wouldn't have a way to plug a gushing underwater oil well that was already figured out. Incredible. "Hey, who would have thought that this could happen?" Well, anyone with any sort of engineering background or even a vivid imagination. Anyone who has ever watched any cheesy "scientific experiment gone horribly wrong" B sci-fi movie from the 50's or 60's, that who. 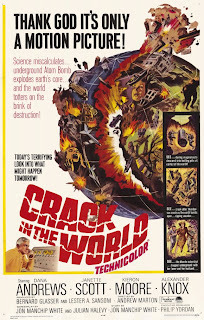 This sort of reminds me of a rather old but apparently very rare sci-fi film called "Crack in the World." Some scientists get the brilliant idea to turn a rocket upside down and shoot it INTO the earth. I forgot the point of this little experiment. 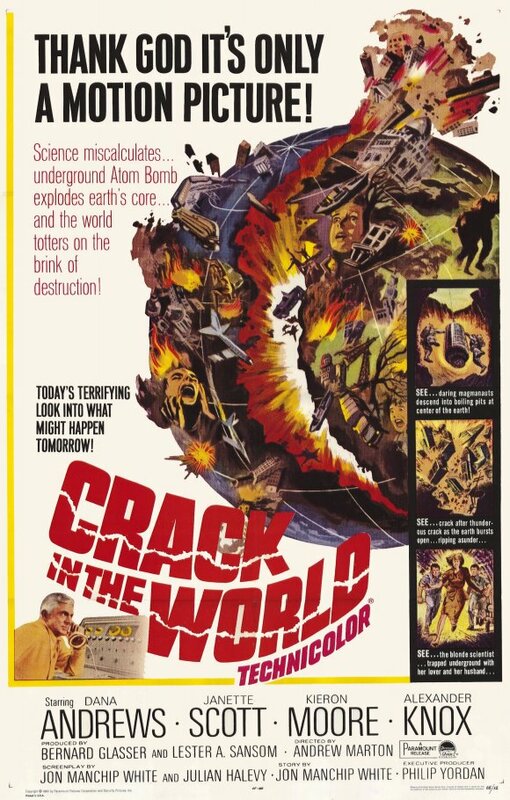 It all goes horribly wrong and the resultant hole starts a large crack in the ground (hence the name of the film). Actually, two cracks start. Panic ensues. Calamity results. The two cracks eventually come around and merge. The result is that it was like an apple corer had been applied to the Earth. A large chuck was forcibly ejected and, viola! It became another moon. Oops.... Sorry about that. Certainly didn't see THAT one coming. O.K., silly analogy. I just am an old sci-fi film buff, so almost everything reminds me of a movie these days. But what kinds of black belt morons do these people have to be to do something that, in retrospect, looks as dangerous and prone to accidents as it turns out it is without any sort of backup plan? Unfortunately, that seems to be the way our society is evolving. Risks are not considered. To consider risks and have contingency plans is to "plan for failure." I was actually told that once at a previous job. Anything that anyone can imagine automatically becomes "the plan", which will be wildly successful. Balls. People have forgotten that life itself is a dangerous business. Pushing the technological envelope in ways that haven't been tried before (such as drilling to such depths in very deep water), by definition, is a dangerous business. To not recognize some possible but somewhat likely outcomes other than the one that you really want to occur is to be blind. Stupid. Idiotic. Which about sums up my feelings about our current society.